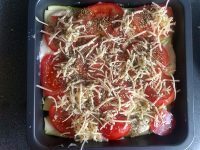 I really love eating tomato; I like the taste and the colour, so I tend to add them in a lot of my dishes and salad. 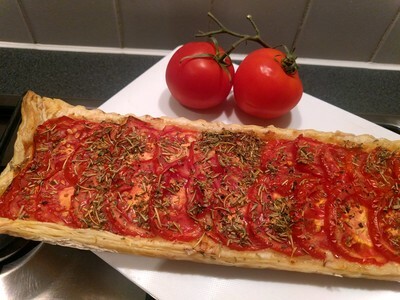 I struggled during quite a time to find the perfect recipe for tomato tart. 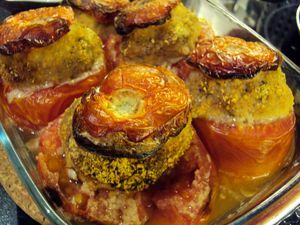 Indeed, when you cook tomatoes, they tend to give back a lot of water which damages the puff pastry. 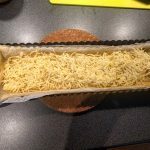 I didn’t want to do a quiche, so I continue to try until I found the perfect trick which was to pre-cooked the pastry and add a layer of cheddar to prevent the puff pastry to become soggy. 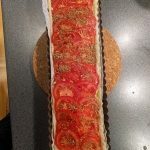 In order to give a lot of taste to the tart, I add a layer of mustard straight on the pre-cooked pastry and I don’t hesitate to sprinkle dried mixed herb on top of the tomatoes. 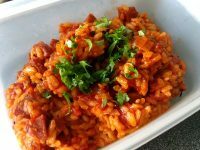 I am glad to share with you today one of my favourite recipes. I really like the mix and of course it contains tomatoes so !!! 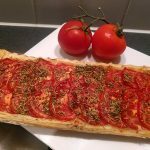 How to bake a tart with tomato? 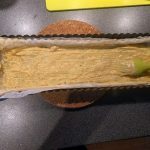 I like to use a rectangular shape mould for this recipe as it gives a different look to the traditional quiche dish. On top of that, I find it easier to put the tomato in a nice order on a rectangular dish than a round dish. 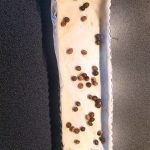 Before baking the puff pastry don’t forget to add some cherry stone on top of the pastry in order to limit the rise of the pastry. The tart needs to be served straight away and it is getting cold quite quickly. That is not really good reheated.